Jill Of All Trades: Netflix and Chil(dren)! I remember when cartoons or kid's content was really amazing when I was a kid. Watching shows like Dexter's Laboratory, Powerpuff Girls, Jetsons, Flinstones, Tom & Jerry, Loony Tunes, Legends of the hidden temple (the list goes on). And they were all in English - which helped build that language stronger. Today's kids have these japanese shows like Pokemon and Doremon - dubbed in Hindi. I don't want my kid to be consuming that all day long! We do usually talk about how to decrease screen-time for kids, but let’s be honest, we all allow some daily gadget time to our kiddos – whether it is as a reward for good behaviour, or to make the fussy ones eat their food or on rainy/smoggy days when we cannot go out. Now I am sure this is a favourite with most young ones. Who cannot love Peppa and her brother George and their snorting piggy laughter! I absolutely love the English/British manners that are taught to kids - from please, thank you to may I's. My kiddo's favourite character is George pig and they both love dinosaurs! Recently, we received a package from Netflix that had a red PJ set for me and a story book for kiddo called - Llama Llama Red Pajama. 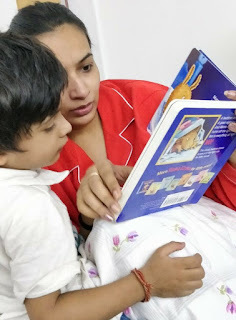 I was touched that Netflix encouraged some mother-son story time bonding, and we had great fun reading the book together! Netflix just recently launched their all new show based on these characters! Currently 1 season is out, and it's quite fun. My munchkin absolutely loves the Talking Tom app that talks back to you in a high pitched voice. He also loves poking the cat or feeding it food. When he saw that there is a show based on this app, he was absolutely thrilled! This is again famous on youtube - they have really good animated nursery rhymes - and toddler totally love nursery rhymes! His favourite rhymes are - wheels on the bus, twinkle twinkle, johny johny, ba ba black sheep and finger family. This is another Netflix original - from the makers of Madagascar. I personally love King Julien and imitate him saying "Maurice!". This is one show me and kiddo and husband all sit together and watch - it's so funny! 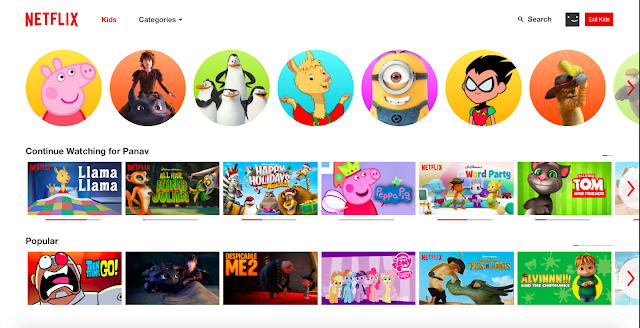 Now, why do I choose Netflix over YouTube for my kid? Recently I had put up updates on how YouTube is full of adult content disguise under the cartoon look and feel, and unfortunately those were seen in the YT Kids app as well. Plus not to mention the ads, they frustrate my toddler as well, trust me. There is a separate Kids account set-up for the kiddo - where he can only access kid's content. Click here to see how to set parental control on Netflix. You can always log into their account and even check what have they been watching. Since I would love to avoid cellphone radiation, it's good to have plenty of options to stream Netflix content on - laptop, tablet and TV. Plus more the distance from eyes, better it is! There are so many kid movies and shows, for all kids age groups - keeping them all entertained. If you have older kids do check out Dragons (From the makers of How to train a dragon), Puss in Boots, Trollhunters and more! They're bound to love the variety. Do your kids watch Netflix too? I would love to know which is their favourite show! If you need to ask me anything about Netflix for kids, I am just a comment or tweet away! Wow...I always thought YT Kids was safe! Thank you for highlighting Netflix as an alternative and safe avenue for kids. I will surely try this for my 4 year old. We love Netflix. I'm so glad my 5 year old loves Llama Llama because it's so cute, unlike the violent Lego videos my 7 year old likes. Love this post!! My kids are all about their iPads lately and Netflix has been one of our go to sources for good clean shows for them. They love Peppa Pig and Super Why! Gotta try out llama Llama now! My kids love all the other shows. Thanks for this! We love our netflix, too. Llama llama, Little Baby Bum & Dinotrux are our favorites right now. Cool list of programs. We still haven't introduced TV to our baby girl. Let's see!